I thought by now I would be tired of Halloween crafts, but I'm not! 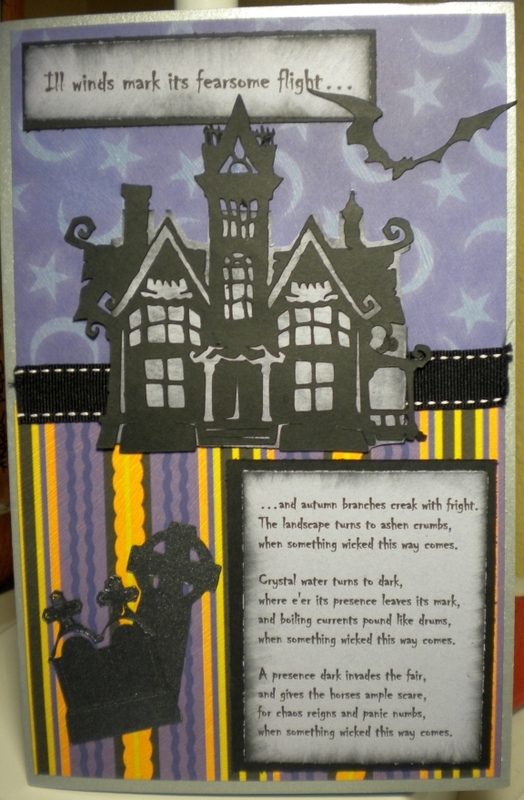 I continue to have a lot of fun with this theme and I am totally still in love with the Cricut October 31 cartridge. Over at Paper Patch Crafts, Anne is having a contest that follows this sketch theme for a card. You have until midnight (woooooo) tomorrow, the 11th, to get your submission in. 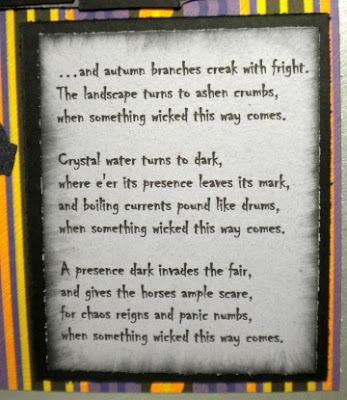 There also was a book with the same title "Something Wicked This Way Comes" written by Ray Bradbury, which was also made into a movie. You could rent that now for your Halloween viewing. But that is not where it ends..."Something wicked this way comes" is a lyric sung in "Double Trouble," a song written by John Williams (with lyrics from Macbeth) for Harry Potter and The Prisoner of Azkaban. You can see a clip of that song here. It was also used as a tagline to the film on posters and other promotional material. And there you have it....my contribution to creepy bits of literature and pop culture. This is awesome dude! I LOVE Halloween.. And am not tired of crafting either! Haha TFS!